← New York Riesling Diary: Day 36 – BEST WHITE WINE ON EARTH The Riesling Story is On Course for Planet Earth! Yes, the world (i.e. New York Wine City, or NYWC) may not want to believe it, but Northern New Jersey is making some great wines including Riesling! That’s where I was yesterday, on my second New Jersey Wine Road Trip (NJWRT) with wine economist Karl Storchmann of NYU and documentary filmmaker Marcarthur Baralla of Defendshee Productions in Brooklyn. We found a great winemakers and also a future Riesling star, but first let me explain the reason I’ve been hunting and gathering in Jersey. 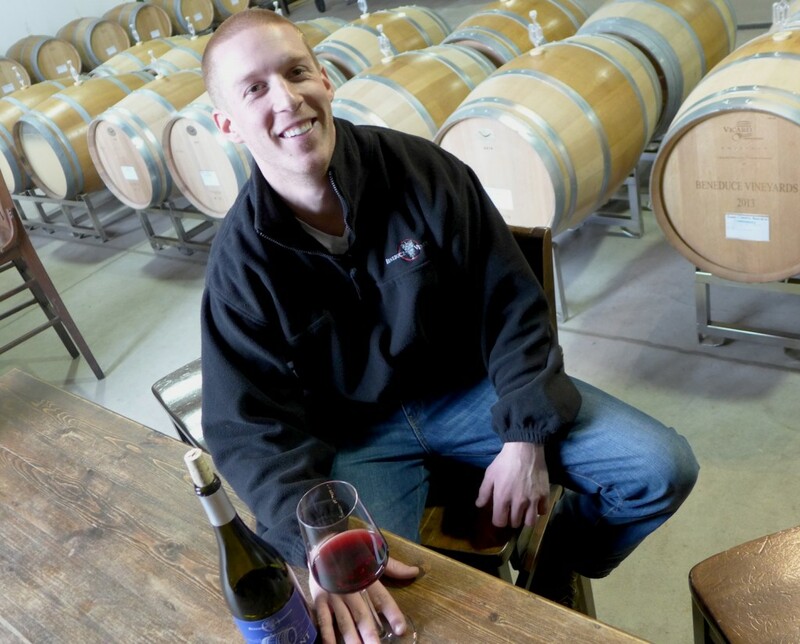 New Jersey wines need champions and in Cameron Stark of Unionville Vineyards in Ringoes the state has one of America’s great winemakers, not that you could even guess this from reading the mainstream wine press. For most of them there seems to be a hierarchy of East Coast wine regions with the North Fork of Long Island at the top, then Finger Lakes, followed a long way behind by everywhere else that wine is grown in New England. The very idea that someone in Northern New Jersey could be a great winemaker must seem absurd to anyone trapped inside this rear view mirror mindset. What makes Cameron so important for Jersey and in the national context is his mastery of a wide range of wine styles. I need to tell you about his most important wines to make this clear. They begin with a style which the mainstream wine press consistently underestimates: medium-dry aromatic whites. Unionville’s 2012 ‘Eureka’, a blend of Riesling, Pinot Gris and Albarino is a delicious wine in this style with a cocktail of fresh fruit aromas, the discrete sweetness accentuating the juicy fruit and crisp acidity beautifully. I hate Viognier, but the 2012 Amwell Ridge Viognier from Unionville manages to marry the over-ripe peach character of the grape with moderate richness of texture and a liveliness rare for this grape. The Pheasant Hill Chardonnay is surely one of the best wines from this grape anywhere in America. I tasted the 2013 from barrel and am convinced this is a great wine in the making! Cameron poured the 2012 alongside the other single vineyard Chardonnays of this vintage from Unionville. Back at Marcarthur’s New Jersey tasting in Brooklyn on November 10th I found a tropical fruit character in that wine over-ripe. In fact, the 2012 Bell Well is the only Chardonnay from Unionville with this kind of aroma. Cameron is convinced that several cases of this wine were wrongly labelled Pheasant Hill by an employee and that our samples were drawn from one of those cases. Certainly the 2012 Pheasant Hill Chardonnay is cool and more herbal than fruity in aroma with the same sleek silhouette as the great 2010 and just a hint of funk from long lees contact. OK it costs just over $50, but this is a great wine. Let me say it straight, forget Kistler! The 2011 Pheasant Hill Syrah is a great example of this grape and a stunning achievement for that very difficult vintage. It has the smoky bacon, pepper, blackberry and leather aromas of a top Northern Rhône wine and very elegant dry tannins. Equally impressive is the 2011 ‘The Big O’, Unionville’s Bordeaux-type blend although this vintage it is 85% Cabernet Sauvignon and 15% Petit Verdot, and I never tasted a red Bordeaux with those vital stats. The black cherry and cranberry aromas are supported by less smoky oak than the more muscular 2010, and once again Cameron has judge the tannins perfectly. From barrel we also tasted the 2013 and 2012 vintages of a Syrah-Grenache-Viognier that is another stunning Unionville red in the making. Then there’s the ‘Vat 19’ Port, a multi-vintage wine made entirely from the hybrid Chambourcin, which can stand next to the best LBV ports. Just like Jersey the Chambourcin grape has an image problem, because it is way down another hierarchy, that of grape varieties. 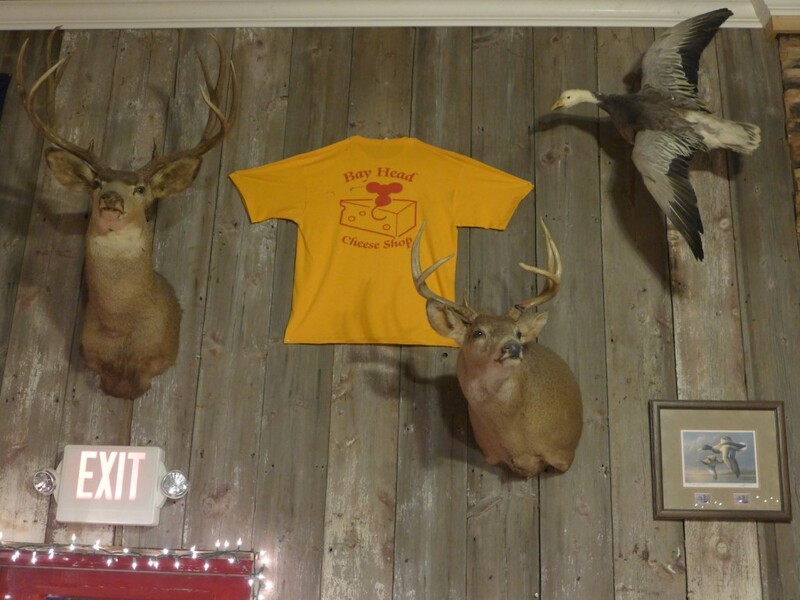 If you were to stick ‘Merlot’ and ‘North Fork’ on the label of the 2011 Silver Decoy Chambourcin red from Working Dog winery in East Windsor then you could easily sell it for several times the $16.99 they charge in the tasting room, a corner of which is pictured above. Mark Carduner is rightly proud of this wine with its forest berry aromas, its rich tannins and fresh finish. We also tasted several lots of his 2013 Chambourcin and that vintage is at least going to match the 2011. At Marcarthur’s Brooklyn tasting my top wine was the 2010 Silver Decoy Cabernet Franc from Working Dog and once again this really impressed. This winery’s high-end reds always have some obvious oak aromas, but also great fruit and there was only a hint of the bell pepper type aromas and sappy character of this grape. By the way, this winery was previously know as Silver Decoy, but a law suit recently forced them to change name. Because the new label doesn’t yet have official approval it will be the Silver Decoy label you’ll encounter. 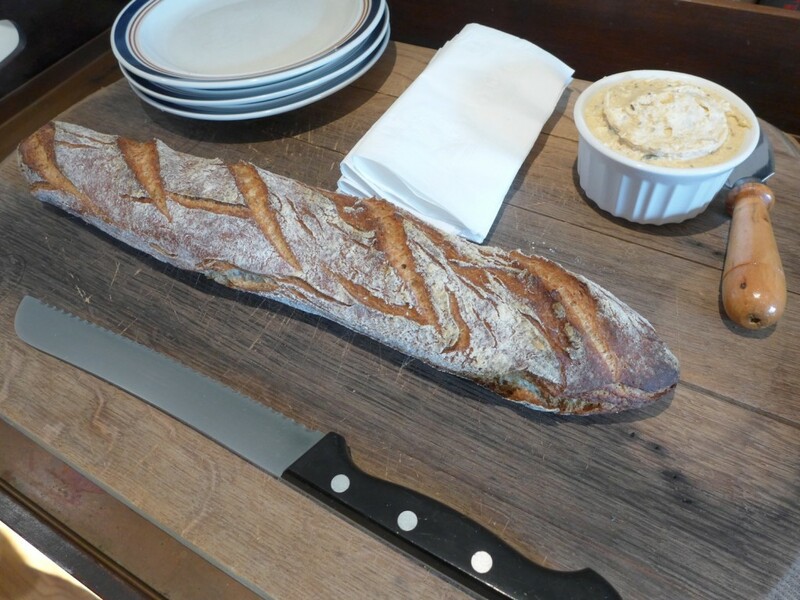 Peter Leitner of Mount Salem Vineyards in Pittstown is not only a talented home baker, as the baguette pictured above shows, but is also the man who proved that Blaufränkisch (the Austrian name for the grape the Germans call Lemberger and the Hungarians know as Kéfrankos) is a vital part of New Jersey’s wine future. Asked about that he said, “I’d rather be lucky than smart”, but frankly it now looks pretty smart! He showed us two 2012 Blaufränkisch which we’d tasted from cask during NJWRT1 on December 20th last year as bottled wines. Together they prove that there’s such a thing as terroir in Jersey. Of them the 2012 Leitner is clearly the superior wine with a wonderful fragrance and silkiness in spite of generous supple tannins, the oak aromas discreet. This is the best red wine Peter’s made to date, but you’re probably going to have to wait a full year to enjoy it, then pay more than $50 for the privilege. Anyone who wants to taste an example of Peter’s hand-crafted reds for a more modest price is recommended the delicious 2012 Zweigelt, which is brimming with cherry aromas, but also has the tannic power he strives for and costs $25. These healthy prices for the top Jersey wines is something else almost nobody in NYWC or the mainstream American wine media have picked up on yet. And now on to Riesling! 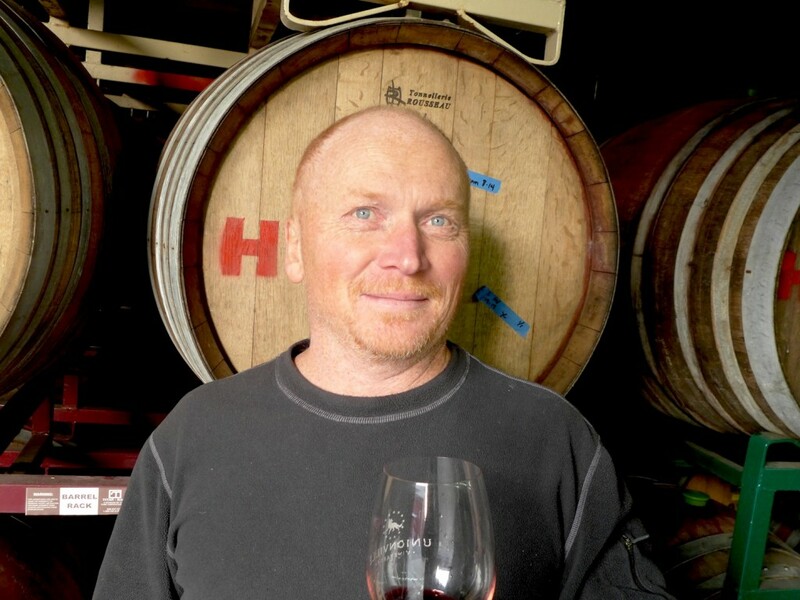 Mike Beneduce of Beneduce Vineyards also in Pittstown/NJ has just put his first wines on the market, although the best of them – the rather oaky, but fresh and peppery 2012 Blueprint Blaufränkisch – isn’t quite out there yet. However, it will be the 2013 whites, which we tasted from tank and barrel, that are going to make his reputation. Of these the most important for me is the dry 2013 Estate Riesling, the first wine of this kind from Jersey which completely convinced me. It is quite a powerful and complex with a certain amount of spice, and that’s perhaps why Mike compares it with Alsace. Frankly, though I think its closer to the Riesling GGs from Germany. The medium-dry 2012 Three Windows Riesling made part from estate fruit and part from Finger Lakes fruit is a juicy and polished wine with pear and citrus aromas for just $16. Jersey has a Riesling star in the making and the only question is if anyone in NYWC or America’s mainstream wine media really cares about that.